Queen Tamaeva III in 1900 put in measures prohibiting the exporting, exploiting or harming the lorikeets in any way. Both adults green upperparts, turning to green/yellow on lower back to flanks and tail coverts; dark green crown, the longer feathers streaked with paler green; dark blue occiput, the longer feathers streaked with lilac/blue; red face and breast to abdomen; purple thighs; red tail. Bill deep orange. Eye red. Underparts dull red, with feathers margined grey/purple. Bill dusky brown. Eye brown. Call is described as shrill croak or screech. Exploitation for this species' red feathers resulted in its prehistoric extinction on the Cook Islands. A significant modern threat on other islands is the black rat, Rattus rattus. Rimatara in the Austral Island group of French Polynesia; Tabuaran and Teriana in the Kiribata Island nation, and most recently, re-established on the island of Atiu in the Cook Islands. Found in mixed horticultural woodland, forested valleys growing coconuts, and village gardens. 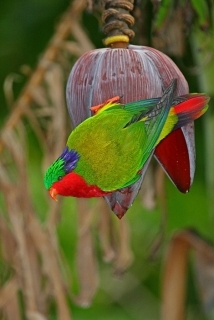 Feeds on nectar and pollen, preferring coconut palms and banana flowers, and frequently coffee plants. Up to 12 species of plant utilitised on Rimatara. Birds are seen in pairs or small flocks of up to 12 birds; is often seen flying above tree tops.